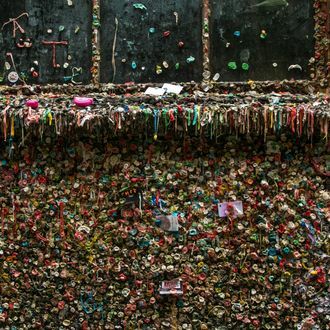 Back in 1991, some people visiting the theater at the Pike Place Market in Seattle thought it would be a great idea to start securing pennies to the wall using slimy, well-chewed gum — or just skipping the charitable donation and using the wall as an open-air anti-gravity trash can. More than 20 years later, the tradition — and a few decades’ worth of gum and human DNA — remains. 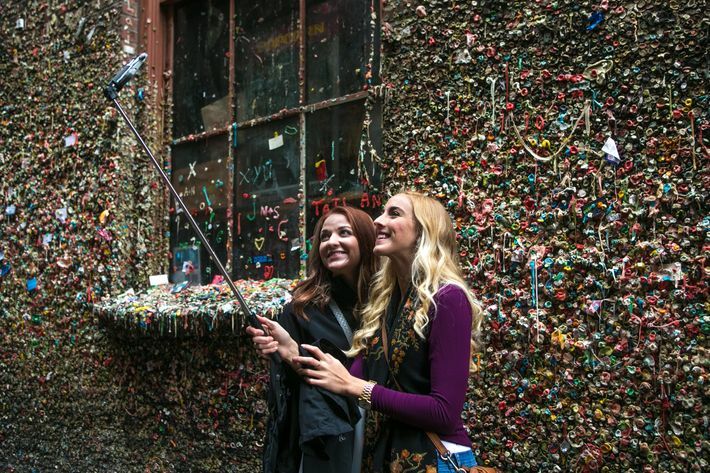 That’s around 1 million pieces of gum, all of which took a detour in someone’s mouth before being blessed and becoming a tourist attraction. Years of accumulation turned the wall into a sugar-coated shrine to spit, Seattle, and, later down the road, selfies. Dozens of colors and flavors are carefully catalogued on the wall, which has slowly begun amassing territory at the market. On hot summer days, locals say the air sometimes smelled like Juicy Fruit. On Tuesday, workers began cleaning the wall. Pike Place Market thought it was finally time for an intervention. The cleaning crew, contractors who were briefly deputized into being wall dentists for a few days, first had to melt the conglomerate of ancient mint goo using steam cleaners. The glop is then raked up and put into buckets. The market is going to weigh the gum once the wall is finally sparkly and fresh, its bricks allowed to breathe for the first time in years. The whole cleaning process is expected to take three days — although the wall has already lost some of its Jackson Pollock tendencies.